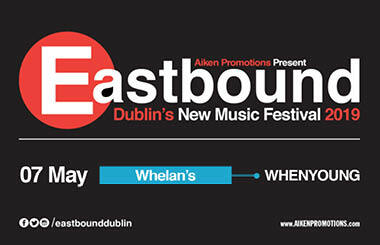 Aiken Promotions is proud to launch EASTBOUND – a six-night stand at venues across Dublin – taking place May 7th – 12th 2019. The first artists announced for Eastbound 2019 include: MAISIE PETERS, KARA MARNI, STEAM DOWN, WHENYOUNG, RHYS LEWIS, THE SNUTS, LION, MEN I TRUST, WILD FRONT, GWENNO, BILK, BODY TYPE, BOY AZOOGA and HUNKPAPA with many more to be announced. 2018 was a landmark year for the Limerick natives with the release of their debut album “Given Up”, and a string of live shows including Shane MacGowan’s 60th birthday celebration alongside Nick Cave and Sinead O’Connor, and supporting Dream Wife, The Vaccines and Peace.